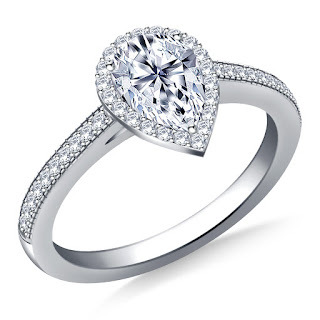 If you are planning a Valentine's Day proposal, this is the perfect time to buy the diamond engagement ring that will wow her. 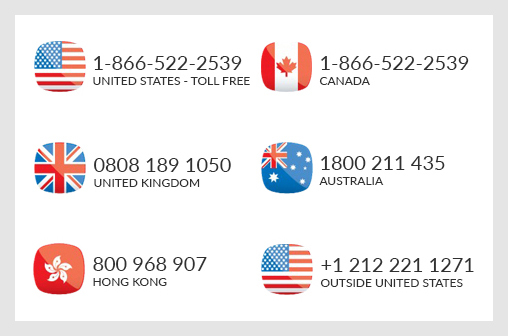 Here are some beautiful choices. This gorgeous solitaire ring is a wonderful choice for a classic engagement ring. A solitaire ring with a round brilliant diamond has remained the preferred choice for popping the question for two important reasons; Sparkle and classic style. Nothing compares to the brilliance, fire and sparkle of a round brilliant cut diamond, especially when featured in this timeless style as the focal point of the ring. 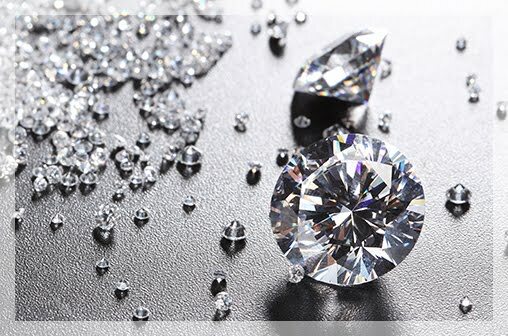 When it comes to diamonds, the cut, of all the 4Cs, plays the most important role for how the diamond sparkles and flashes. A typical round brilliant cut diamond has 57 facets – all cut to offer maximum light reflection so the diamond sparkles brilliantly. The solitaire ring style has also stood the test of time so it never goes out of style, making it a classic choice for your bride-to-be. The ring style complements just about all outfits and occasions. 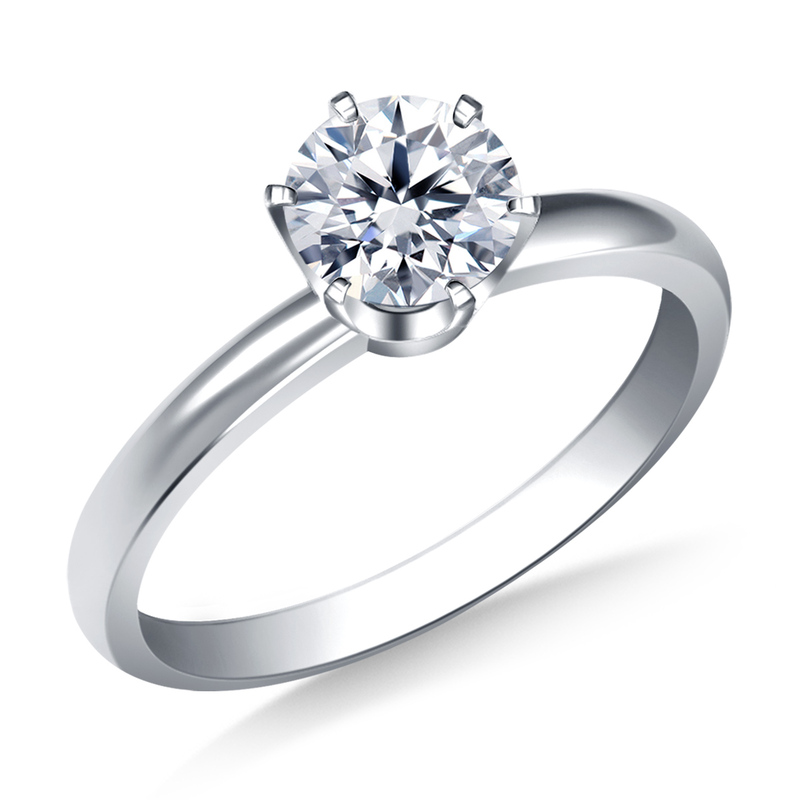 For a solitaire, always choose the best diamond you can within your budget as the diamond is the star of the show. A GIA certified triple excellent diamond (excellent cut, polish and symmetry) is a good place to start. Later, you can narrow down your selection based on clarity, color and carat. Generally, diamonds with VS1 and better clarity grades are considered 'eye-clean'. This grade indicates that the inclusions or flaws within the diamond will not be visible without 10x magnification so they are not visible to the naked eye. As for the color, opt for diamonds within the range D to H for a bright white diamond. You can choose the metal depending on your partner's personal style. Platinum and white gold are favorites because they complement the diamond's white brilliance but you can also opt for yellow or rose gold. 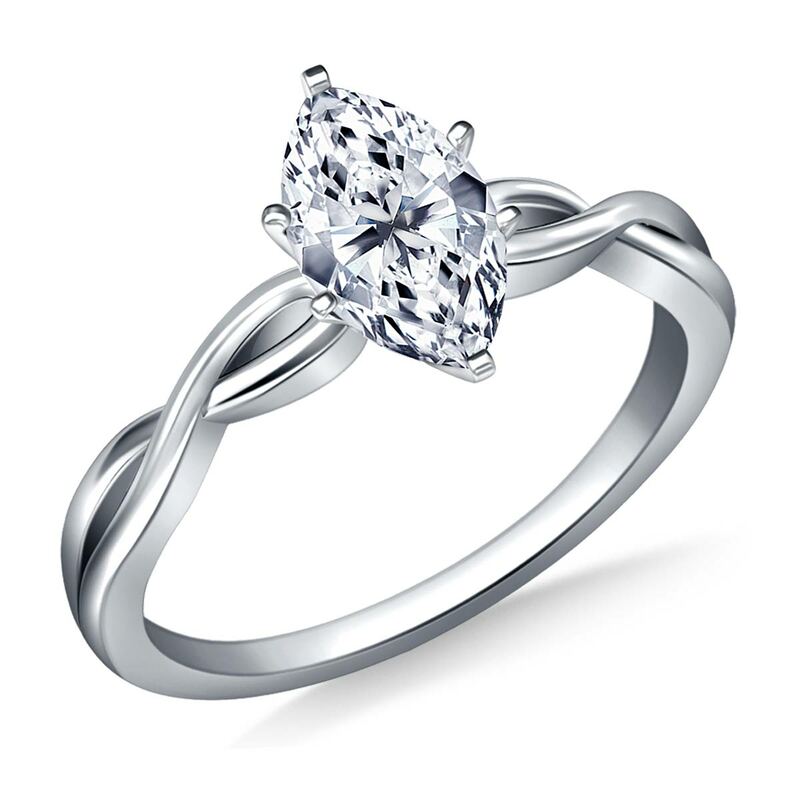 Solitaire rings come with different settings and different styles of ring shanks. This beautiful ring, for instance, has spiral detailing on the shank. 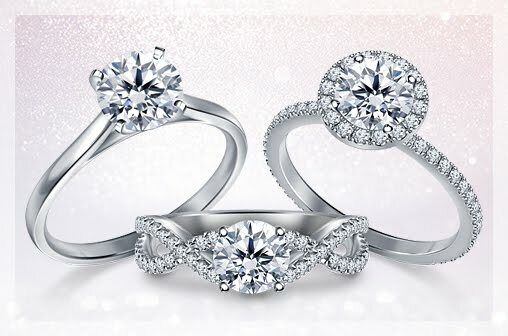 You can never go wrong picking a beautiful diamond in a solitaire setting. This is a cathedral style halo engagement ring in 14K white gold. 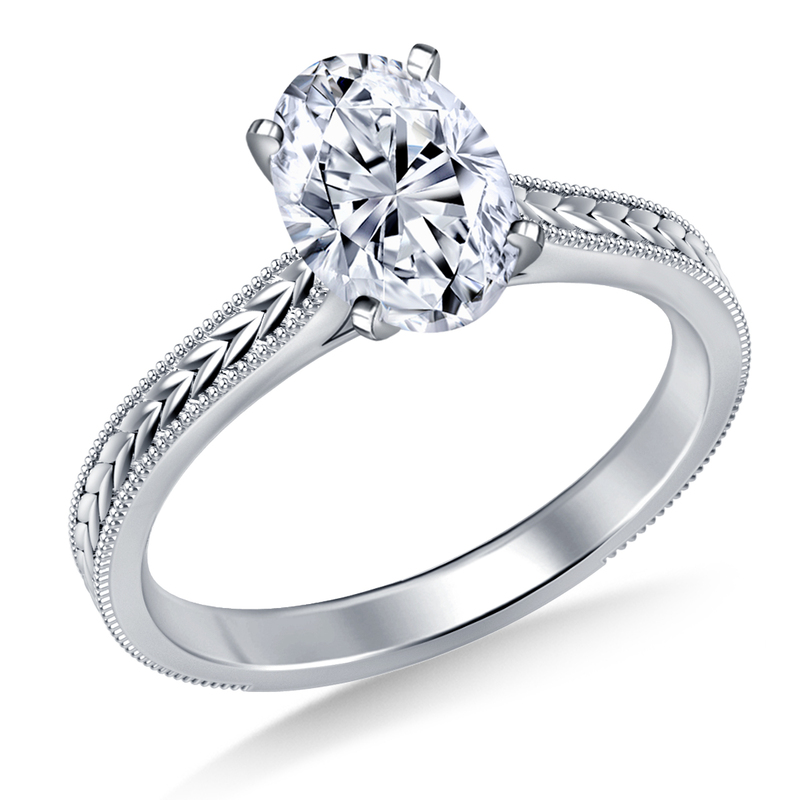 The halo design is a beautiful update on the classic solitaire engagement ring. 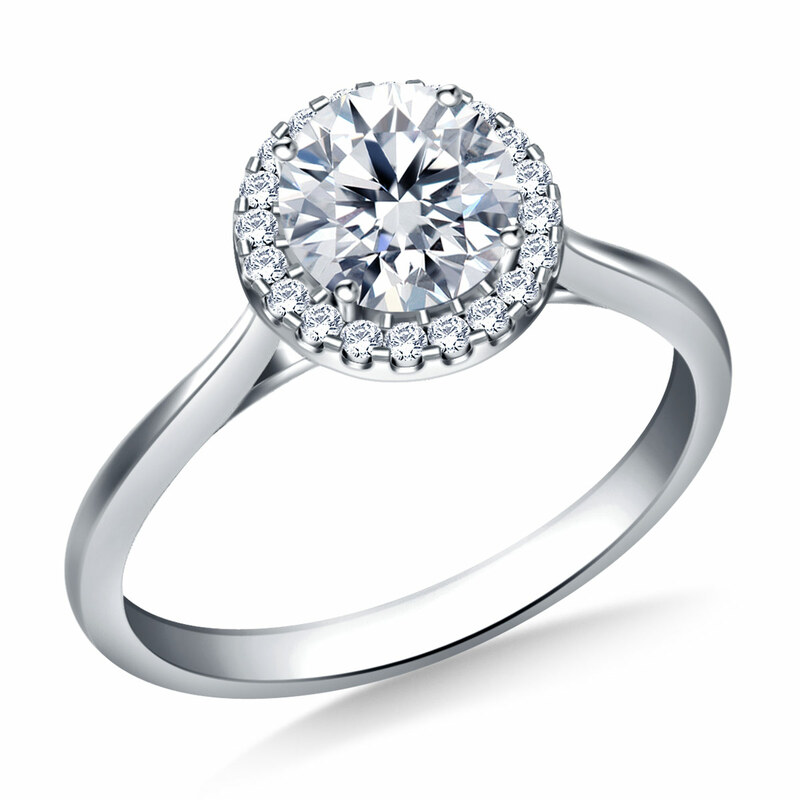 The center stone is surrounded by a circle or 'halo' of smaller diamonds. This design can be a good choice to make your center diamond appear larger. The halo of smaller diamonds enhances the center stone and can make it appear bigger and more brilliant. These rings are available in a wide range of styles and metal types. If you want to present your partner with something a little more unique, consider a diamond in a shape other than round: a “fancy shape.” This halo engagement ring has a pear-shaped diamond, and there are many other shapes available. 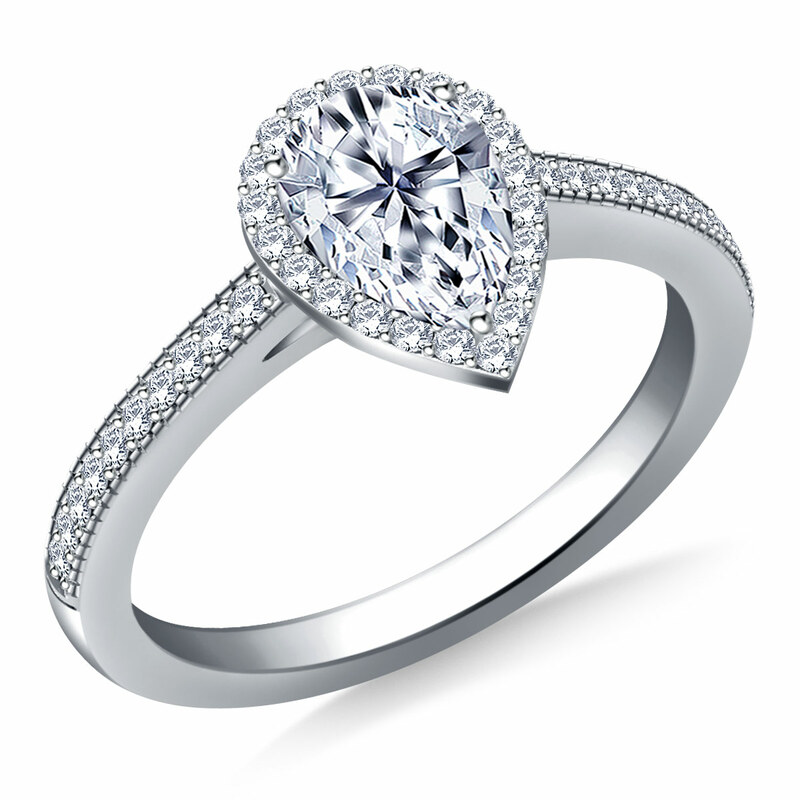 The princess shape is a popular choice among fancy shaped diamonds. 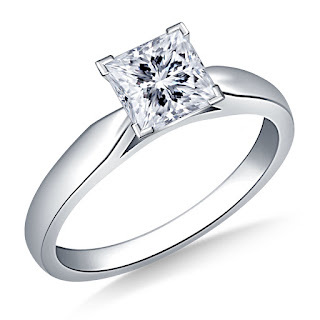 This princess diamond is set in 14K white gold ring with a beautifully tapered shank. This ring is a great choice for someone with contemporary and modern tastes. An oval diamond is also a good choice for an engagement ring with a different look. This oval ring features engraving and milgrain texture on the shank, giving it a distinct vintage appeal. 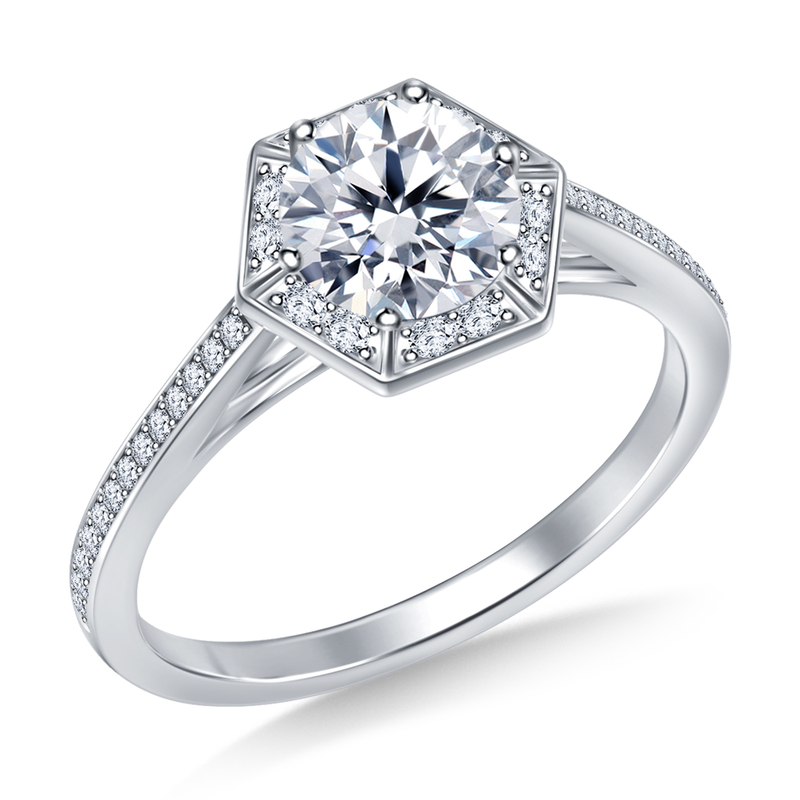 For a larger look, consider an engagement ring with a marquise diamond. 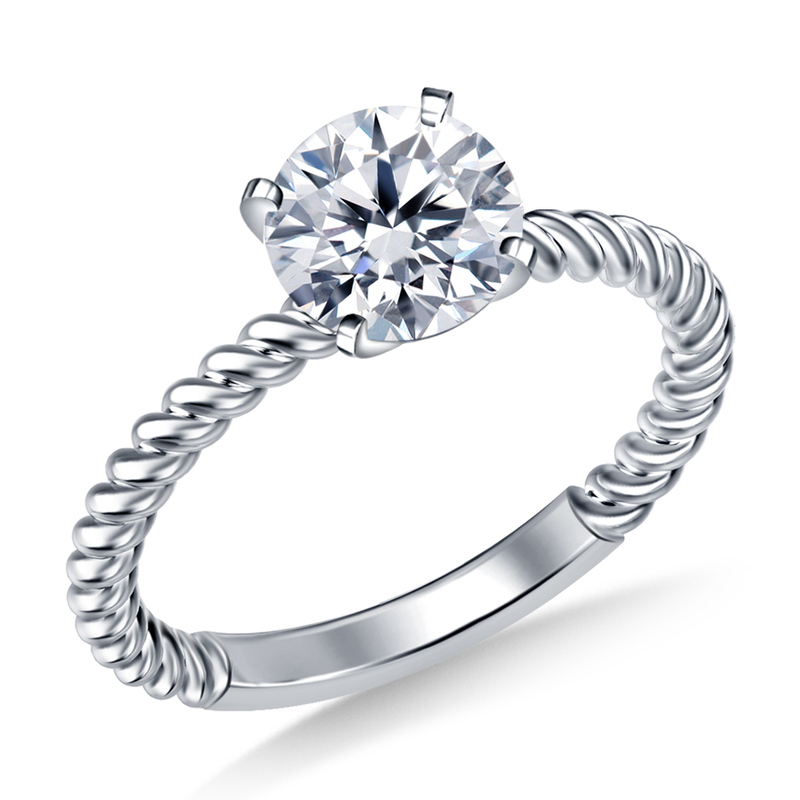 This beautiful engagement ring features an infinity knot style ring shank. Before you settle on an engagement ring with a shape other than a round brilliant, do keep an important factor in mind. The round brilliant cut diamond is a popular choice because of its sparkle and maximum reflection of light. Other shapes may not have the same amount of sparkle and brilliance and reflect a personal sense of style rather than a desire for the most possible ‘bling’. 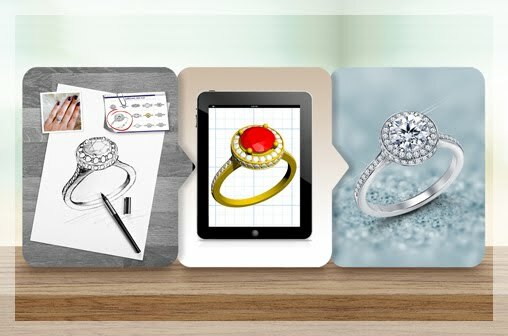 Take a look at the diamond blueprint images to understand their light performance when choosing diamonds of different shapes. The three stone engagement ring has a special significance. The smaller stones signify your past and future to come, while the larger center diamond is your beautiful shining present. 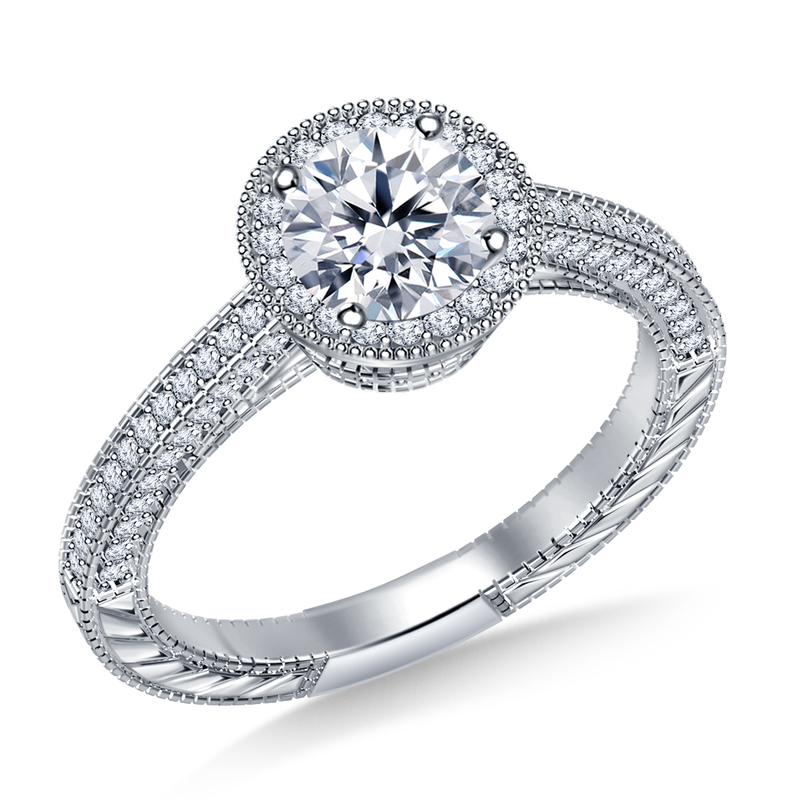 This gorgeous ring has round diamonds set in prongs. 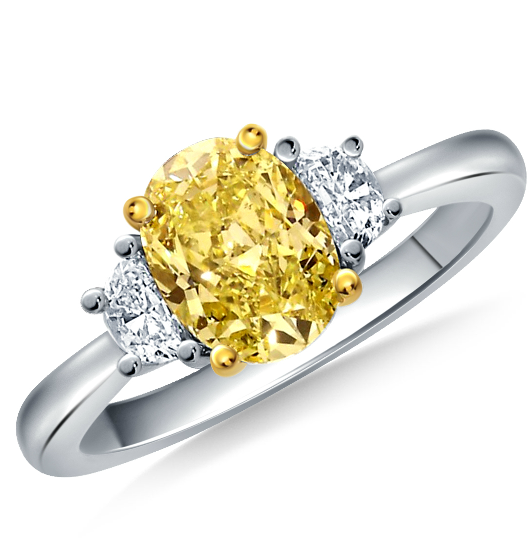 If you want to splurge and get your partner something truly unique, engagement rings with diamonds in fancy colors such as yellow and pink are stunning. 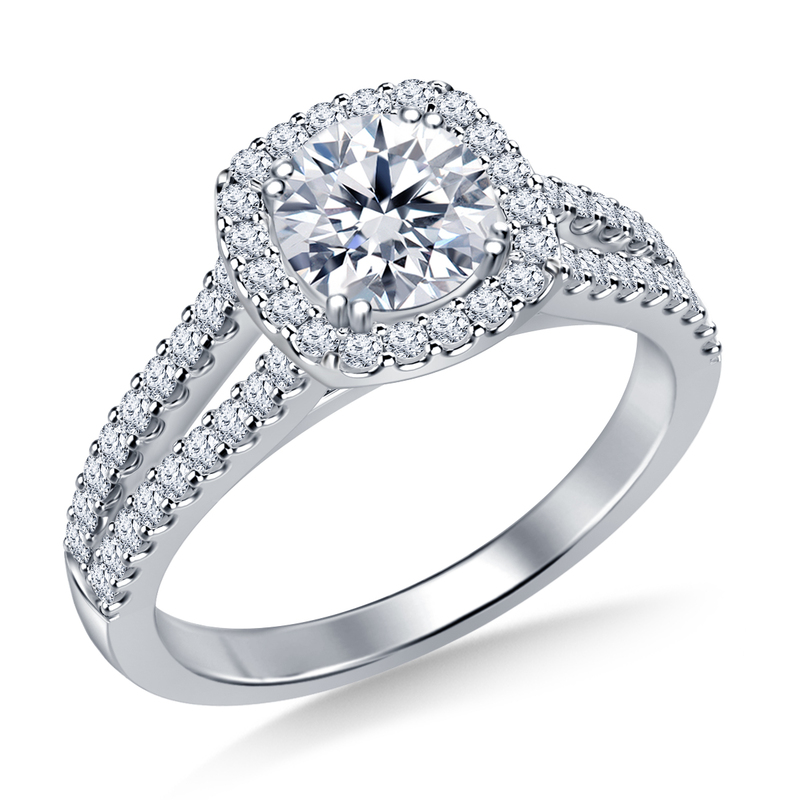 This engagement ring features a 1.22 cttw. yellow diamond. The wonderful thing about all these rings is that they can be customized. Browse through our selection of loose diamonds to find something that will get you that 'yes' and will fit your budget. The metal of the ring can also be customized if your lady love has a particular preference. Choose from 14K and 18K yellow gold, white gold, rose gold or platinum. 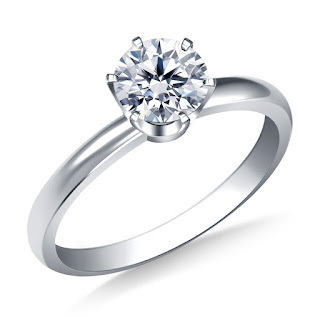 We also have a selection of pre-set engagement rings, if you would like something that is ready to be shipped. This rose gold three-stone engagement ring has a 0.98 cttw. round diamond in the center. It is a wonderful choice if your partner prefers vintage-style jewelry and clothes. Try to pick up subtle clues about her personal style to find what kind of a ring she'll love. For a woman who has a subtle yet sophisticated sense of style, this round diamond engagement ring with baguette diamonds on either side is a good choice. Remember that, engagement ring shopping should be a fun experience! Use her social media and Pinterest-type pages for a surprise engagement. If you're worried that her taste may be very specific, you can always browse for the ring together. If you want to keep the element of surprise but are still unsure, check our return policy and try at home service. 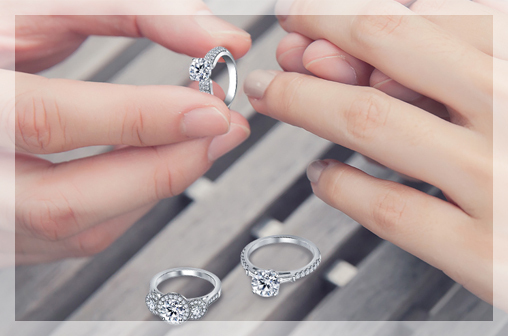 We know you will find the best ring for your 'the one' with these styles and tips.